The Arizona teachers were on strike for a week. My daughter, at home with three kids because of it, took them to Phoenix one day to join in the protest. What a great thing to do! Education in Arizona is poorly funded because the Republicans, who often send their kids to private schools, would rather pass tax breaks. Here’s why I left: phew! You can read that blog and the ones preceding it. 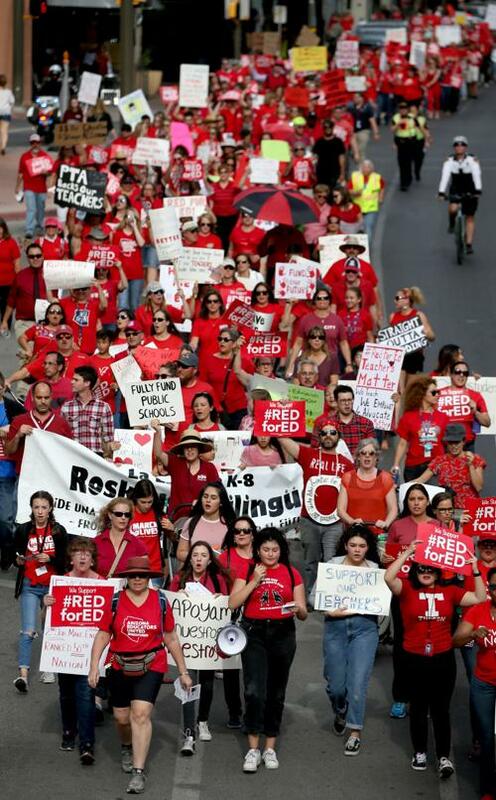 The 2018 Arizona teachers’ strike was held from April 26–May 3, 2018 by 20,000 teachers to protest low pay and cuts to school funding. Arizona Governor Doug Ducey had approved a proposal giving a 20 percent raise to teachers by 2020 with a 9 percent raise in 2019; teachers rejected this proposal as it did not provide increased funding for schools themselves or raises for support staff. It has coincided with a similar strike in neighboring Colorado. The strike ended on May 3, 2018 when the Government of Arizona conceded to increase funding to increase salaries for support staff and to decrease student to counselor ratios. The Governor’s “plan” still does not have details in legislative form, so we do not know how he is claiming to fund the proposal. From what we have seen so far, this is not financially sustainable beyond the upcoming fiscal year, and nonpartisan legislative economists project a $300 million deficit within two years. While the legislature is famously unpredictable, here’s my best guess on what the upcoming week might look like, so you can be prepared to act when necessary. There are no set times for any of these steps to commence. This could be the last week of session if there is a budget deal, as the Governor has asserted. If there is a deal, it will only be with Republicans because neither legislative Democrats nor the leaders of the Red For Ed movement have been consulted. If there is a deal, it will be a part of the overall state budget (including all funding for all state agencies and many other policy changes, not just education) and the first bills will be introduced on Monday. Later that day, there will be a Committee of the Whole on the House and Senate floor. This is where the bills will be debated by elected members and the public can watch in the gallery. Please pack the galleries. As your elected official, I need you to witness this. We as Democrats will attempt to amend the budget bills to address the true priorities of Arizona, including sustainable education funding. Our amendments will likely be voted down, but we will make the case for investing in ourselves instead of giving taxpayer money away to out-of-state corporate interests. This often happens in the middle of the night. Sometimes from midnight till 6am. I’m not kidding. Then on Wednesday, the final vote will be tallied for or against the bills, they will be submitted to the Governor for signature, and the session will likely end. Other bills will be voted on throughout these last days as members try to get their other priorities through, and bills once thought dead could come back to life, so I will be watching for those carefully. I suggest you do too. Keep up the pressure. Your advocacy is working. Thank you for helping to revitalize our democracy, and stay involved. It’s worth it. Does anyone know how it went? KELLY: … I want to ask you, Matt Lee – this is not your first time traveling to North Korea, not your first time traveling there with the U.S. secretary of state. You went along on the plane with Madeleine Albright when she traveled in 2000, and I’m curious what differences you saw… as you’re driving by … what do you see out the window? What’s it look like? LEE: We arrived early in the morning, like what would be rush hour in a normal city. There was more traffic than certainly there was 18 years ago… Most of the morning commuters that we saw were either on bicycles or on foot – farmers, soldiers, people who are potentially office workers and lots of children in school uniforms walking to school along the side of the road. The city, from what I remember from 18 years ago, was not a sprawling metropolis of skyscraper-type buildings. That has changed. KELLY: Suggests money is coming from somewhere to pay for that. LEE: Exactly, exactly. Despite …severe sanctions on North Korea… the city is still growing up and out. A church across the street from the office has three Sunday morning services. The first is in Creole. A woman waiting in line ahead of me at a store Pickup had her hair in about 30 narrow braids. Asked her how long it took – 10 hours! Her son, age 7 he told me, was shuffling around doing basketball moves the entire time. A woman leaving the store behind me had two children; the daughter, who looked about eight, was bouncing sideways, perhaps a soccer move. Kids have such energy! 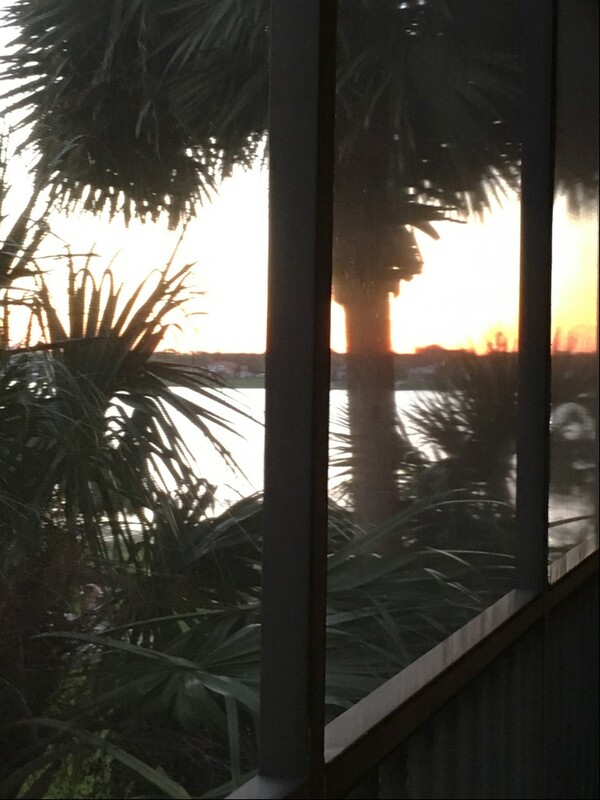 Each evening, when I get home from work, I get a glass of wine and the newspaper and sit on the patio overlooking Sand Lake. Much better view than my last place, which was mostly plants, although it was interesting to see a squirrel in a palm. Can you tell what this quote refers to? A friend of mine in her mid-80’s, whose husband had died a few years ago, had moved to a retirement village. This last year she hooked up with a fellow retiree whose wife had just passed away. Serendipity! This entry was posted on May 11, 2018 at 4:39 pm and is filed under Arizona, education. You can follow any responses to this entry through the RSS 2.0 feed. You can leave a response, or trackback from your own site.